Email Campaigns allow you to organize your emails together according to your own preferences; but also to market your space, measure campaign costs and response rates. Email Campaigns can be accessed from under Member > Email Campaigns. This is where you will find any existing campaigns and can create new ones. To create an Email Campaign, you will first need a mailing list which should contain the contacts you want to email. This article shows you how to create one. To create a new email campaign, go to Member > Email Campaigns and click New. Name your campaign - Keep it short and to the point, so that you can easily identify it later. You campaign name can be upto 255 characters. Add a Description - Here is where you can add more details about your campaign. Enter a Budgeted Cost for the campaign. Add an Expected Response (%). Add the Expected Revenue that the campaign should generate. Enter the Actual Costs of the campaign. Add the Start Date of your campaign. Activate the campaign by checking the checkbox. Save your changes to complete the setup. Once your Email Campaign has been created, it will be visible in the list. Click on its name to view it and also start adding emails. On the Campaign page, you will see the information you have just added; some basic system information (who has created/updated the campaign and when); as well as an Emails section, where you can add emails to the campaign by clicking New. Add your new email - Give it a name so you can easily recognize it later on. Select an email template, Edit the body of your email if needed. Click Next. You can also Save your setup if you want to return to it later. Under Email From, enter the email address that you want to show as the sender’s email address. Email From Name is where you can add the name that you would like to associate to the above email address and display as the name of the sender. Select the Mailing Lists that you want to send the email to. You can add one or more mailing lists. Simply select one from the Mailing Lists dropdown and click Add. The list you select will now appear below, in the To field. Add a Subject for your email. Add a Test Email Address which you can use to send a test email before you set up the campaign, to ensure that emails get delivered and are formatted according to your layout. Click Send Test to do so. 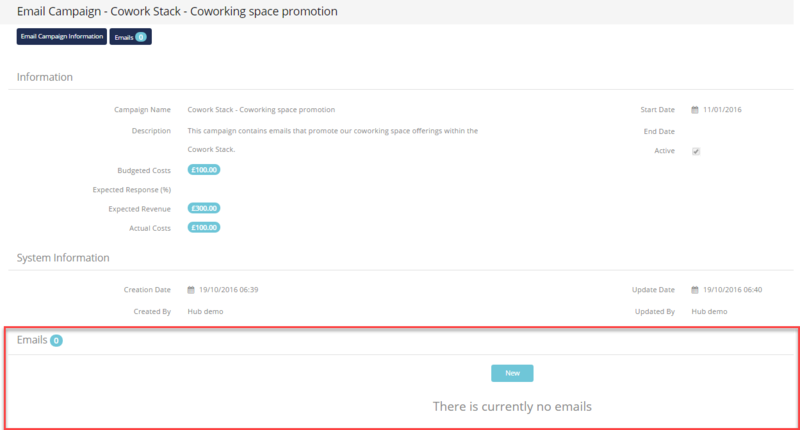 Operate will now give you the possibility to send the email as an announcement on your portal. Click Send Now to do so; then click Save to finalize your campaign. You can also save your setup directly and skip creating the announcement. As you receive replies to your emails, you will see the response rate change in your list of campaigns. You can go through the same setup and add multiple emails, pertaining to the same campaign; and track them all together. To edit the main email campaign as well as the emails you include within it, simply use the pencil icon found on the left side of each record. To delete a campaign or email, use the red "x" button on th left.